Our patron saint (Latin name Aegidius) is said by medieval writers to have been a noble Athenian, possibly the son of King Theodore and Queen Pelagia, though this seems unlikely as these names do not appear other than in legends concerning Giles and we cannot find evidence of Athens having kings at this time. His authentic history is solely in southern France, roughly in the period 640 to 720 AD, where he was a hermit under the protection of the Bishop of Arles. He had renounced his family wealth to follow a monastic life and was eventually persuaded to become Abbot of a monastery which the King of France built for him in the place where his hermit's cell had been. He was buried in his own abbey at Saint-Gilles-du-Gard near Arles, which became a place of pilgrimage and the first stop on the road from Arles to Santiago de Compostela, the pilgrim Way of St James. His shrine in the crypt of the abbey is apparently the subject of pilgrimage by women wishing to become pregnant or dealing with infertility, though the reason for this is unclear. St Giles was a popular saint in the Middle Ages, appealed to by those in need. He is the patron saint of cripples, as a result of his lameness. The story tells how, when he became lame, he would not accept any cure, preferring to use his infirmity as a means of mortifying his flesh. 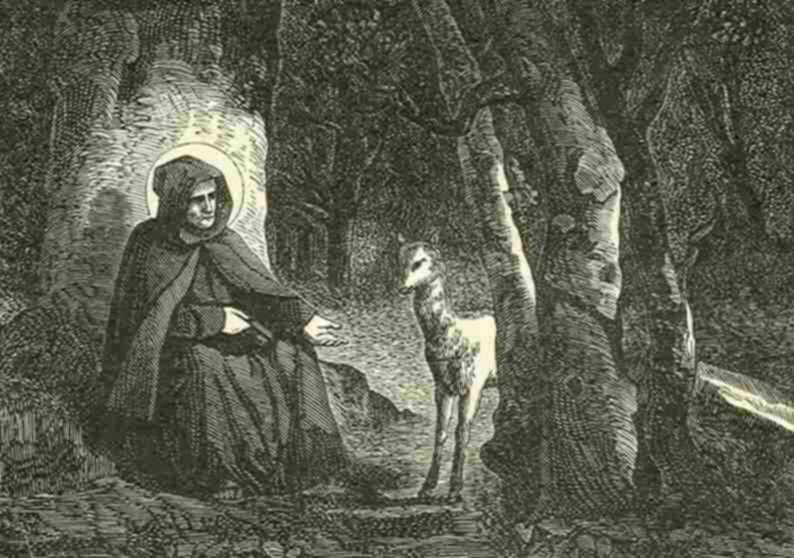 Another story about St Giles is that of the Holy Hind, which is said to have found the saint near to death in a remote cave; she suckled him with her milk and thus saved his life. One story combines these events, saying that the king's hunters tried to shoot the hind and wounded Giles instead, thus causing his lameness. Many churches and hospitals were dedicated to St Giles, including what is popularly known as St Giles Cathedral but is officially called the High Kirk of Edinburgh - he is the patron saint of Edinburgh and also of Graz in Austria. Cripples used to gather and ask for alms outside St Giles Cripplegate at the entrance to the City of London. Closer to home, St Giles Fair fills the roads around St Giles Church in Oxford on the Monday and Tuesday following the first Sunday after 1st September, that being his feast day. The Roman Catholic Church includes St Giles as one of the Fourteen Holy Helpers, saints whose intercession was considered particularly effective against various diseases (the plague in Giles' case); he is the only one of the fourteen who was not a martyr. The picture below is a detail of the central panel of the Moreel Triptych by Hans Memling, 1484, which is in the Groeningemuseum in Bruges in Belgium. Memling, who was the best-paid painter of his day, is buried in St Giles Church (Sint-Gilliskerk) in Bruges, as are many other painters. The church contains superb paintings and is one of Bruges's many tourist attractions. In Provence the journey ends. Saw him as an abbot there. Over seas the message ran. English churches bear his name. This hymn has been sent to several St Giles churches including those mentioned above, so we don't know where it had its first performance, but the first in Water Stratford was on 18th September 2016.